Sen. Toni Boucher, R-Wilton, announces the end of her exploratory campaign for governor outside the Capitol. Sen. Toni Boucher, R-Wilton, ended her exploratory campaign for governor Wednesday and declared her candidacy for re-election to the state Senate seat she won in 2008. She made a similar exploration in 2014, then ran for re-election. 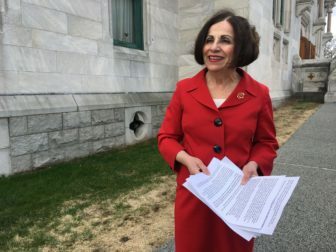 Her exploratory committee had an $18,395 balance at the end of March, which she will transfer to her campaign in the 26th Senatorial District of Bethel, New Canaan, Redding, Ridgefield, Weston, Westport and Wilton. Boucher’s decision was not unexpected. Her fundraising had lagged, falling short of $15,000 in the most recent quarter. Her total fundraising of $97,465 fell far short of the minimum to participate in all but the first two of the five GOP gubernatorial forums. The final forum is tonight in New Canaan.